I saw this wonderful and simple cartoon strip this morning on LinkedIN. You have one mouth and two ears – speak less – listen more! This will help you, if you want to interact effectively with other people. However in the real world that ratio is typically the opposite – talk too much and do not listen. 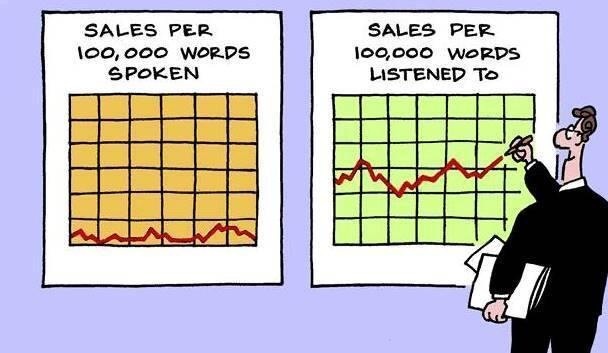 In sales I think most people agree that ineffective sales people talk too much. From behavioural research at Huthwaite International we actually observe this phenomena. We find that the typically ratio for average performing sales people doing major complex sales, is three times more Giving Information (talking) than Seeking Information (talking asking questions). Now both behaviours are still about talking. Further the airtime of the buyer is being less than the seller when observing selling conversations done by average sales people. Listening is about the space given to the buyer after Seeking or Giving Information. It’s the space where the seller shut up, and the space where both the seller and buyer shuts up their verbal contributions. Effective sales people use the empty space to listen and truly understand what is being said. Next, they also test that they have truly understood the buyer asking questions that test understanding. First then they might decide that now it’s time to present how the needs voiced by the buyer can be met by the unique value the they can bring to the table. In other words, effective sellers listen with the intension of understanding – empathetic listening. In business to business major sales settings we know from Huthwaite International research that ineffective sales people talk more than asking questions, and listen even less. further we know that outcomes from these behaviours are: less sales, less customer loyalty – in essence less trust and less business compared to the outcomes achieved by effective sales people. First you would have to find out what you are actually doing when having conversations to persuade your prospects or customers to buy from you. Seller: “Peter, can I ask, when it comes to your sales effectiveness, in what ways are you challenged these days? 2. After each question: Shut up and listen for with the intend of understanding what is being said. Now, make sure you do not talk back before 3-5 seconds of silence have passed. Seller: “Would you so kind as to elaborate with me in more detail Peter? Seller: “Just to be sure I got this right, you said that…………, did I get that right? Changing behaviours from average to excellent can be difficult. If your not even aware of how you actually interact and dont feel challenged, achieving your expected outcomes – then why change? A way to find out is to try and record a conversation you have with another person using the MP3 recorder in your smartphone, and then listen to yourself and the behaviours you apply. If your on the selling side: Do you like what your hearing – do you talk too much and listen less? If your on the buying side: Do you feel the Seller understands what your saying? Excellent article, Thanks! 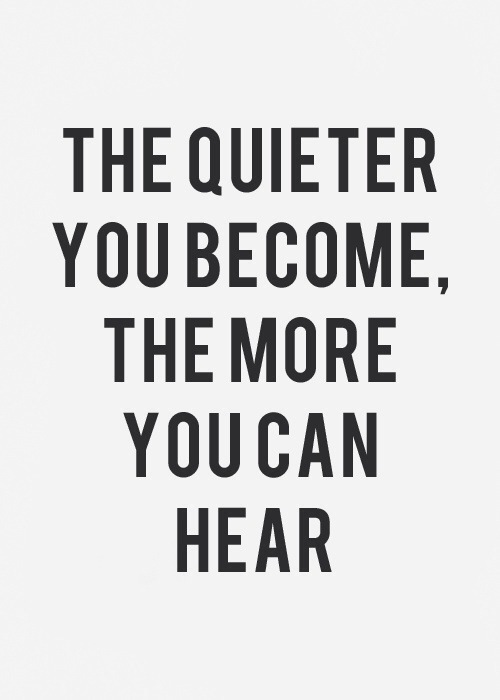 Mastering “Listening” is a continuous learning life long. I also suggest to readers Charles Green’s “Trust Based Listening” for wonderful articles on how to listen effectively. Thx Haluk, om glad you liked it, and I know Charles and even David Maister briliant writing are good reads. Super and spot on. Thank you! In addition to passing along the good news, Joaquin sent along some talking points basically a quick summary of some of the things we loved about the clip. I mean, it s really important that we use Precise Praise and help developing teachers see what was so good about it.